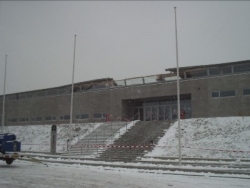 Henrik Elmgreen reports, that after at lot of problems the re-building started mid October and that the roof is nearly completed. 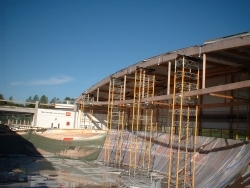 It is expected that the indoor-facilities, including the track, will be repaired and the whole venue will be ready for action again around the 1st of April 2004.
pictures (c) Henrik Elmgreen from "UIV.dk"
Also in September the roof of The Siemens Arena is still open. The damage is continuing. 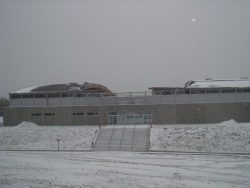 In March the roof of The Siemens Arena is still open and the interior and the track are still open to all weather influences. 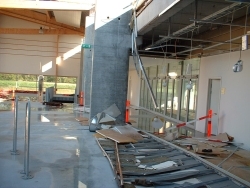 The track has been damaged quite a bit by falling roof elements. Why don't you go there too? "Our" track seems to be severly damaged in the northern part. 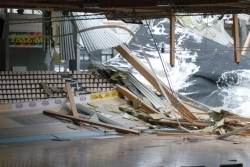 We sincerely hope that it will soon be safe again to go into the hall, so that we can check the damages to the track, which have been caused by their falling roof construction and the exposure to the weather. January 23rd, 2003 The cranes are in action and the securing measures are taking place after the latest reports from Copenhagen. 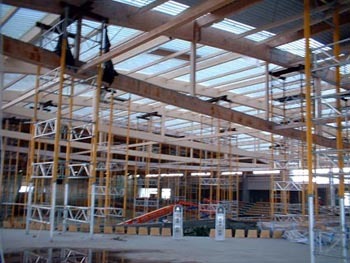 The roof constructions are lifted and strenghtened section by section. Discussions in Denmark are still going on, how this could happen at all. Storm in Denmark !!! The cranes are ready for action. But.... now the wind is too strong. A storm is heading into Denmark. Tonight and tomorrow winds between 60 and 110 km/h (30-60 mph) are being expected! January 15th, 2003 The latest plan in Copenhagen is, to lift the complete roof with the help of 6-8 big cranes in order to install some additional support or strengthening construction underneath the existing construction. Access to the inside hall is still denied. Different theories about the reasons for the accident are in discussion between the concerned engineers and companies in Denmark. As long as there is no access to the hall possible, these theories cannot be finally confirmed. After the organisers of the 6-day-race were in discussion with two other halls in Copenhagen, they finally had to decide not to organise any 6-day-race in Copenhagen this year. 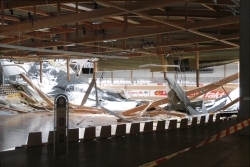 The Siemens Arena will remain the location for track cycling in Copenhagen and a fast and final repair of the damage is necessary. January 13th, 2003 The roof is still open and it rains (also into the hall). 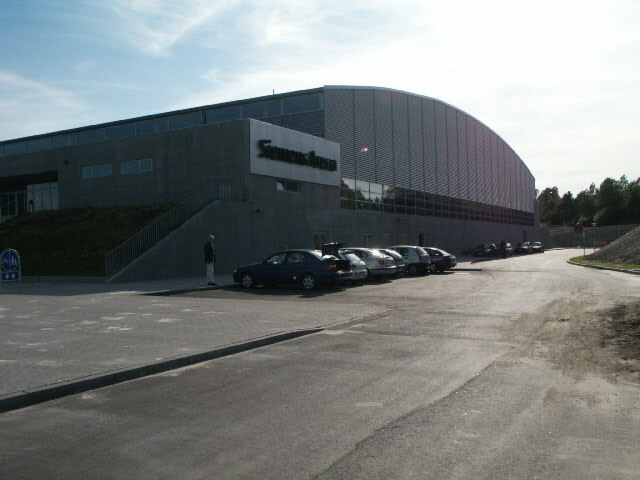 January 10th, 2003 A large meeting with the state authorities and the involved Danish companies (and their lawyers!) has been held in order to find the reasons for the accident and the measures to take. So far there are only assumptions. Further research, more time and additional assistence is required by the authorities. Research for alternatives Henrik Elmgreen, the sport director of the Copenhagen 6-days, is still researching alternative possibilities for holding a 6 day-race in another venue in Copenhagen this year. "We have our responsibility against our track cycling fans and our sponsors to undertake everything possible to possibly realise the 6-day-race in another place". Elmgreen is presently discussing the possible options in Copenhagen. "The public interest for the 6-days in Copenhagen is so big, that we have to consider all options", said Elmgreen, "even if we have to change the date of the event for later February"
Outstanding solidarity support When the news went around that the 6-days of Copenhagen had to be cancelled because of the unfortunate accident, there came a spontanious support offer for the Danish track riders, which would have had the chance to compete on their home track. The organizers of the Berlin 6-days with their front-men Heinz Seesing and Werner Ruttkus offered yesterday to organize a country competition "Denmark against the rest of the World" in frames of the Berlin 6-days after the Sunday afternoon session of the 6-days in Berlin on January 26, 2003. 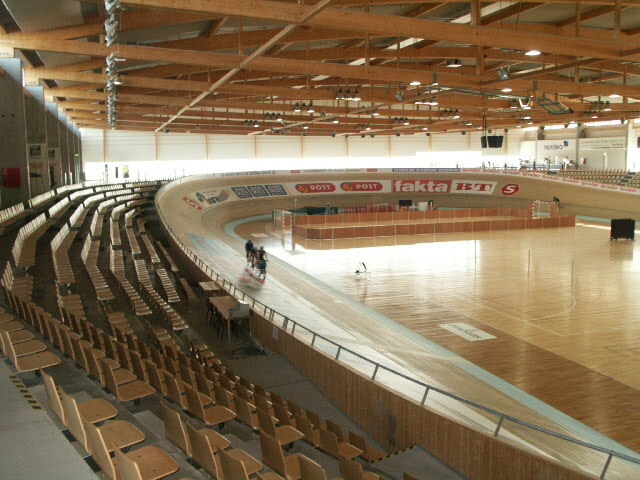 From this additional event on the Berlin track money will be donated to the national Danish track riders, so that they can prepare themselves for the World-Cups and the World-Championships 2003 on other tracks in Europe, while their home-track is not available. A real outstanding example of solidarity within the track cycling family and between professional 6-day-promoters, who also are sometimes severe competitors. Activities are underway to secure the remaining roof construction, so that the opening can be covered and further damage to the hall interior by weather influence can be avoided. 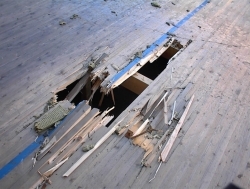 From "ear"-witnesses it is reported that obviously first the bottom-chord of the roof truss cracked and then also the top chord collapsed and the roof part fell down into the hall. 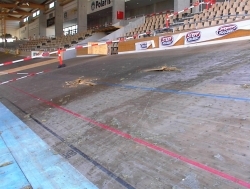 All pictures (c) Benny Damm from "6-dages.dk"
A provisional estimate assumes at least six months before the Arena and the track will be again ready for use. January 6th, 2003 Presently research is underway to find out, what caused this accident. Copenhagen is experiencing winterly weather conditions with frost, snowfall today and tomorrow and high Humidity (75%), which is now also affecting all installations (and the track) in the hall partly open to the weather influence. 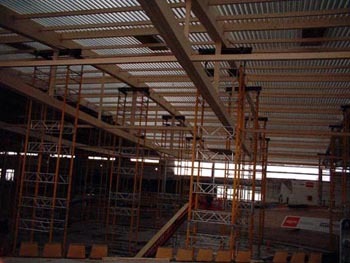 The roof construction parts dropped into the hall and on the track. The situation is difficult, since nobody is sure yet, if the remaining roof parts could also come down. with friendly permission of "uiv"
January 3rd, 2003 On January 3rd, 2003 at 6.45h a.m. a section of the roof construction of the Siemens-Arena broke and collapsed! Luckily nobody was in the hall at that time and nobody got injured. The evening before there was a full training session on the track. 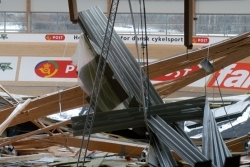 The Copenhagen 6-day-race (Jan, 31st - Feb, 5th 2003) consequently had to be cancelled !